"It's like hanginga little set of barbells on every molecule in your body." For most space travelers, the first effect of weightlessnessthey feel is nausea. But over the next few days and weeks, the lack of gravitytakes its toll on the rest of the body, leading to muscle and bone massdepletion and troubles regulating blood pressure. To counter these losses, astronauts on the International SpaceStation spend hours exercising everyday. But even this can't compare to aworkout with gravity. When they return to Earth after a long mission,astronauts spend weeks rebuilding muscle and repair bone. Now, researchers at UC Irvine and the National Space BiomedicalResearch Institute (NSBRI) have developed a two-person, centrifuge-like,one-stop workout machine that makes its own gravity. They call it the Space Cycle. Imagine a two-person, hanging merry-go-round. A spinning wheelsits on top of a thick steel pole. On one side of the wheel hangs a recumbentbicycle. Opposite the bike is a cage-like platform. One person sits on thebicycle while the other stands on the platform. As the bicycle rider pedals, the merry-go-round begins to spin,causing both the bicycle and the platform to spin around the pole. As themerry-go-round spins faster and faster, both the bicycle rider and the personon the platform begin to feel the effects of artificial gravity caused by themomentum of the device. The person on the platform can now perform squat exercises atgravity equal or greater – the researchers have produced artificialgravity seven times that of Earth – to what they would experience onEarth. "If you go to a gym and do squat resistance training, youhave this concentration of weight in the form of a barbell across yourshoulders, which is quite uncomfortable," project leader Vincent Caiozzoof UC Irvine and NSBRI told SPACE.com. "With hypergravity, the distribution is equal throughout the body. It'slike hanging a little set of barbells on every molecule in your body." Squats – an exercise where a person stands upright with aload on their shoulders, lowers themselves to a crouch, and stands back up -strengthen the calf, thigh, and back muscles, which are also the muscles whereup to 25 percent loss occurs. But Caiozzo doesn't want to stop there. "The way I envision the platform now is to use it as ahypergravity exercise gym," Caiozzo said. "Imagine you have a barabove your head, you could do pull ups. Or, we could put a treadmill on theplatform and it would be like running on Earth." And the biker gets a good workout too - while the person on theplatform is doing the heavy lifting, the biker is in charge of keeping thewhole thing spinning and experiences a gravity increase as well. If the bikerneeds to work out their upper body, they can switch to a hand pedal attachmentfor the 10-speed bike. Muscle loss may be the most glaring effect of time spent inmicrogravity, but bone loss is just as big a problem, especially since oncebone is lost, it's very difficult to regain. "Bone mass is lost at different rates in different partsof the skeleton. In the hip, the rate is between 1 percent and 3 percent permonth," said Joyce Keyak of UC Irvine. "Over a 6month mission, theloss of bone mass in the hip averages about 15 percent. Loss of bone in the hipis particularly important because the hip supports the body when we walk." For now, scientists don't know whether this process can bereversed once the astronaut returns to Earth. Ongoing studies show somerecovery of bone mass and strength, but the bone is never as good as it waspre-flight. However, Keyak believes that the Space Cycle could act as apreventative measure. "The Space Cycle may help astronauts retain their bonemass and bone strength by creating forces on the body that resemble those due togravity," Keyak said. "Not only is force applied to the skeleton, butfluids tend to be shifted toward the feet, just like on Earth. By applying theseconditions for a period of time, we hope that the bone will respond as if itwere in a gravitational field." 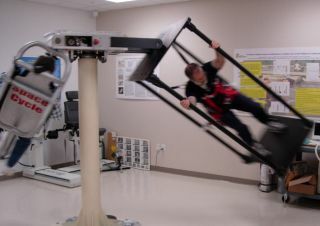 Spending a little time exercising in artificial gravity mayalso help astronauts regulate their blood pressure better. After being inmicrogravity for an extended period, coming back to Earth's gravity causes allthe blood in your body to pool in your legs and away from your brain –like when you stand up first thing in the morning and see spots in front ofyour eyes. However, when you stand up from bed, the muscles in your legshelp pump blood back up towards your brain, but you don't have that luxury whenyou leg muscles have lost their strength after weeks in microgravity and ittakes a few days to get your blood pressure right. "While they're up there, they're also losing aerobiccapacity and conditioning," Hicks said. "Through the work and theartificial gravity effects, this could be a one stop exercise center for theseguys." Astronauts on long space missions currently spend about twohours of their extremely busy day exercising to combat the effects ofmicrogravity. But by using the Space Cycle and the artificial gravity itproduces, astronauts may be able to make better use of their time. "Anything that would help reduce the time of exercisewould be beneficial," Caiozzo said. "If we can narrow that time downto half an hour, that would be great." Caiozzo and his team are still testing the Space Cycle todetermine how much good it might do in space. One problem with evaluating itseffects, though, is that prolonged exposure to microgravity is still not fullyunderstood. "It could be that 24 hours in a microgravity environmentis such a stimulus that you can't overcome it," Caiozzo said. "Evenin you're on the bike for 4 hours a day, it might not be enough to overcome theother 20 hours in microgravity." The next step in this research will to be to test the effectsof exercise on bed-ridden subjects, who show muscle and bone atrophy similar topeople returning from space. Scientists are hopeful that the Space Cycle will prove to beeffective at preventing bone and muscle loss, and say it may help astronauts'minds as much as their bodies. "One of the common things that individuals want to have isa place where they can do exercise," said Caiozzo. "There's abehavioral component to it – many of us feel better when we exercise andworse when we don't." Currently, the Space Cycle's diameter is about 12 feet and thewhole thing is made of steel, so it weighs a lot. Caiozzo says that its weightcould be brought down to 50 to 100 pounds total by using carbon compositematerials, and its diameter could be reduced by about a foot. "That puts it in the dimensions for the InternationalSpace Station, and we've been told to think of a 12 to 13 foot diameter forcrew exploration vehicles," Caiozzo said. More Muscle: Why Do Workouts Work?